I started doing it 4 years ago and think that it sculpts my body into the best shape ever. Unfortunately, I have severe SI Joint Subluxation issues and find that EVEN Pilates puts a strain on my back and sets off my SI Joint to sublux. I'm currently receiving Prolotherapy injections to strengthen my weak and overstretched Left SI Joint but Im desperate to find exercises that don't hurt me! Any Pilates suggestions because I'd be sooo sad if I had to discontinue my Pilates exercises. SI Joint issues seems to be one of the main questions I get from readers. The Sacroiliac Joint is a very sensitive area due to the connection of the pelvis and sacrum, which is a major nerve center in the body. This is also the area where we carry most of our weight whether in a standing or sitting position so moving and sitting with good posture is of the utmost importance. When you have an imbalance on one side like you do with the weaker left SI Joint unilateral exercises work best. One exercise in particular that I like to use to balance out a weakness in the spine or pelvis is holding a bridge position. When doing this press deeper into the weaker sides foot or shift your weight into the weaker side while holding the pelvis lifted and level. This works great on a foam roller too, lying longways on the foam again working to strengthen the weaker side by shifting weight into that foot. I will direct you to some of the pages that I feel would be most helpful for you to address your SI Joint issue. This page has good information about pelvic imbalance and SI joint dysfunction. This question is about hypermobility issues in the SI Joint. I also did a bit of research on the sacro wedgy and found it may be helpful to use while doing Pilates exercises on the mat. It takes in to account the length/tension imbalance with tight hip flexor muscles and weak and stretched muscles in the sacral region. The sacro wedgy supports the sacrum in a lying or sitting position. You may find a link to it from the google ads on this page or search it online. Physical therapy usually begins with correcting any mechanical or leg-length asymmetries. Individualized exercise programs should address strengthening of the core muscles surrounding the spine and restoring postural position of the femoral-pelvic-lumbar complex in a specific ways with the emphasis on the position of the femoral head in the acetabulum. With development of chronic pain SIJ belt should address limitation in SIJ rotation and stability for hypermobile ligaments.The SIJ belt also will prevent recurrence of the leg-length inequalities. Even if the injections do relieve pain in SIJ, this relief alone is very frequently transitory. Consequently, using the injections should be a part of an additional specific rehabilitation program. The pain relief offers a window of opportunity to intensify the rehabilitation process to achieve maximal benefit. There is no clear evidence of when to repeat an injection. The use of fluoroscopy is beneficial when injections are rendered under fluoroscopic guidance. In the event of difficulty with accessing the SIJ utilizing fluoroscopy the CT and MRI can be used instead to guide injections into area of maximal pain. Controlled randomized studies of 24 patients demonstrate the efficacy of both intra and extra articular infiltrations with a mixture of anesthetic and steroid with the evidence of significant decreased pain score on visual analog scale (VAS) in the control group Another study cited by the same authors confirmed benefit of injections by demonstrating pain decrease of >79% in the control group while no benefit was noted in placebo group. Presently, majority of evidence leans toward intra articular SIJ injection, but only for short term pain relief. Knowledge of the specific site of injection and imaging techniques could give the physical therapist information necessary for making clinical decision. I really appreciate your response and enjoyed reading the links. Funny thing, I actually HAVE a sacro wedgy! It is my BFF and Ive actually taken that baby to Asia and Europe!!!!!! I dont know what I'd do without it and think it has been a huge help for me. Thanks again and I look forward to referencing back to your site! I am currently receiving prolotherapy treatments for lax ligaments and bilateral SI dysfunction. 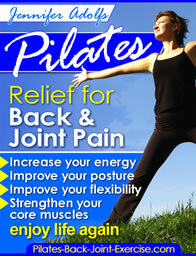 I have been doing Pilates, level 3 reformer and mat for a couple of years 3x/week. Will Pilates intefere with my treatment's effectiveness? First, I'd like to offer a definition of prolotherapy to the reader's who are not familiar with it. "Prolotherapy is the treatment of soft-tissue damage through the use of injections. The injections lead to inflammation in the area, and the body reacts by increasing the blood supply and sending more nutrients to the area, resulting in tissue repair. The term prolotherapy is derived from the word prolo, short for proliferation, as the therapy is intended to proliferate tissue growth in the damaged area." Because the prolotherapy causes inflammation and soft tissue damage to the areas of injections I believe you should back your Pilates exercises off to a lower or modified level 1. When you exercise at a high level with increased tension you add additional muscle tears and inflammation from your workouts on top of these treatments. Pilates is a great form of exercise because it is low impact, however it still creates strength, which means there is some muscle tearing and rebuilding going on so you want to be sure you just do the exercises at a maintenance level only not increasing or adding tension until your treatments are finished. Also, because of your lax ligaments and SI Joint imbalance I would decrease the range of motion for exercises like the leg circles , side kicks, bridging, and footwork exercises with the feet turned in or out. Check out the different levels of Pilates workouts including the modified exercises in my ebook available here.